Roberts made his major league debut on June 18, 1948, and in 1950 he led his Phillies—whose overall youth earned them the nickname the Whiz Kids—to their first National League pennant in 35 years. Roberts started three games in the last five days of the season, defeating the heavily favored Brooklyn Dodgers at Ebbets Field, in a pennant-deciding, season-ending, 10-inning game. This marked his 20th victory of the season and Roberts became the Phillies' first 20-game-winner since Grover Cleveland Alexander in 1917. Roberts also started a game in the 1950 World Series (could not do this in the opener because of his being heavily used in those last days of the regular season). From 1950 to 1955 inclusive, Roberts won at least 20 games each season, leading the NL in victories from 1952 to 1955. Six times he led the league in games started, five times in complete games and innings pitched, and once pitched 28 complete games in a row, with one game being 17 innings. During his career, Roberts never walked more than 77 batters in any regular season. In addition, he helped himself as a fielder as well as with his bat, hitting 55 doubles, 10 triples, and five home runs with 103 RBIs. His 28 wins in 1952, the year he won The Sporting News Player of the Year Award, were the most in the National League since 1935, the year Dizzy Dean also won 28 games. Although he had 28 wins in 1952, Roberts had his best season in 1953, posting a 23–16 record and leading the NL pitchers in strikeouts with 198. In a career-high 346⅔ innings pitched he walked just 66 batters, and his 2.75 ERA was second in the league behind Warren Spahn's 2.10. One of the most memorable highlights of his career occurred on May 13, 1954, when Roberts gave up a lead-off home run to Cincinnati Reds (then known as the "Redlegs") player Bobby Adams and then retired 27 consecutive batters to win 8–1, on a one-hit game. Roberts consistently (11 out of 14 years) had a better winning percentage than did the Phillies in games in which he had no decision. Overall, the Phillies were 1,020–1,136 from 1948–1961, a winning percentage of .4731. Roberts was 234–199 in that span, for a winning percentage of .5404. Roberts pitched for the Orioles later in his career. After the 1961 season, Roberts was sold to the New York Yankees, who acquired the slumping pitcher from the Phillies for slightly more than the $20,000 league waiver price. On February 6, 1962, the Phillies announced that Roberts's uniform number 36 would be retired by the team on March 21, 1962, when the Yankees would visit Clearwater to play the Phillies in a spring training game. It was the first uniform number to be retired by the organization. Roberts started for the Yankees in the spring game, gave up four runs in three innings, and was the winning pitcher in the Yankees' 13–10 victory. He was released by the Yankees in May 1962 without having appeared in a regular-season game for the Yankees. He signed with the Baltimore Orioles on May 21, 1962. He went 42–36 with a 3.09 ERA in 3 1⁄2 seasons with the Orioles. In his final year in Baltimore, he was the first road roommate and mentor to Jim Palmer who made his major league debut in relief of Roberts in the third inning of a 12–9 loss to the Boston Red Sox in Fenway Park on April 17, 1965. Palmer said 47 years later, "Robin Roberts helped teach me even though he knew I was probably going to take his job." Dissatisfied with his new role as a spot starter and long reliever, Roberts requested his release which was granted by the Orioles on July 27, 1965. Roberts signed with the Houston Astros on August 5. He signed with the Chicago Cubs on July 13, 1966, with the additional capacity of assisting pitching coach Freddie Fitzsimmons. Roberts was also reunited with fellow Whiz Kid Curt Simmons. His final major league game was with the Cubs on September 3, 1966 at Forbes Field. He was released by the Cubs on October 3, 1966. He pitched for the Reading Phillies during 1967. Roberts was elected to the Baseball Hall of Fame in 1976. Ahead of the August 1976 induction, Roberts was named honorary captain of the National League for the 1976 Major League Baseball All-Star Game, which was hosted by the Phillies at Veterans Stadium. After one season (1976) as a color commentator on Phillies broadcasts, Roberts coached the University of South Florida Bulls baseball team from 1977–1985. He led the team to its first NCAA Tournament in 1982. His uniform number 36 was also honored on the center field wall at USF's now-demolished baseball venue, Red McEwen Field. During the baseball off–season, Roberts toured with the Robin Roberts All–Stars basketball team. The team played against other touring squads, such as the Harlem Globetrotters. Roberts was also the president of the Gold King Seafood Company in Philadelphia, even during his baseball career. He appeared on an episode of What's My Line? in his capacity as president of the company, even though the panelists recognized him as a baseball player. Roberts was inducted into the Philadelphia Baseball Wall of Fame, as well as the Baseball Hall of Fame. In his 19-season career, Roberts compiled a 286–245 record with 2,357 strikeouts, a 3.41 ERA, 305 complete games, 45 shutouts, and 4,688⅔ innings pitched in 676 games. He is second to Jamie Moyer for the major league record for home runs allowed by a pitcher (505) and holds the record for most consecutive opening day starts for the same team with 12, from 1950 to 1961. Roberts was the only pitcher in major league history to defeat the Braves franchise in all three cities that the team has been based in: Boston, Milwaukee, and Atlanta. Roberts' record for home runs allowed can largely be attributed to his durability and his tendency to pitch inside the strike zone. Roberts threw 4688 innings over the course of his 19-year career, 21st on the all-time innings pitched list. Moreover, Roberts challenged hitters to put the ball in play, issuing relatively few walks (1.7 per 9 innings pitched) and strikeouts (4.5 per 9 innings pitched). Robin Roberts's number 36 was retired by the Philadelphia Phillies in 1962. In 1962, the Philadelphia Phillies honored Roberts with the retirement of his uniform number, 36. In 1966, Roberts was inducted into the Pennsylvania Sports Hall of Fame. In 1969, in conjunction with Major League Baseball's celebration of the 100th anniversary of professional baseball, the Phillies conducted a fan vote to determine the Phillies all-time team. On August 5, 1969, at Connie Mack Stadium, the Phillies honored the members of the all-time team, including Roberts as the only right-handed pitcher. He was also honored as the greatest Phillies player of all-time. 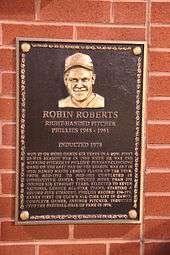 In 1978, the Philadelphia Phillies inducted Roberts as the first Phillie in the Philadelphia Baseball Wall of Fame (along with Connie Mack as the first Athletics player in the Wall of Fame). In 1983—the one hundredth anniversary of the founding of the Phillies—Roberts was selected as one of only two right-handed pitchers on the Phillies Centennial Team. In 1992, Roberts was one of 30 members of the charter class of former Michigan State University Spartan athletes, coaches, and administrators inducted into the MSU Athletics Hall of Fame. In 1998, the Wilmington Blue Rocks retired Roberts' No. 36 at the Carolina League All-Star game held at the Blue Rocks' Frawley Stadium. He was the first former player to ever have his number retired by the team. In 1999, he ranked No. 74 on The Sporting News' list of the 100 Greatest Baseball Players, and was a nominee for the Major League Baseball All-Century Team. On July 21, 2003, Roberts returned to Montpelier, Vermont, to accept two honors: The Vermont Mountaineers retired his number from his playing days with the Barre-Montpelier Twin City Trojans, and Governor Jim Douglas presented him a proclamation that made the day "Robin Roberts Day" in the State of Vermont. On April 3, 2004, the Phillies new ballpark, Citizens Bank Park, officially opened, with a statue of Roberts outside the first-base gate. Also in 2004, Roberts was a member of the inaugural class inducted into the Philadelphia Sports Hall of Fame. In Roberts' home town of Springfield, Illinois, Robin Roberts Stadium is named for the former ballplayer. Roberts was an outspoken critic of Little League baseball. His remarks on the organization appeared in a 1975 Newsweek article. The Phillies wore a patch commemorating Roberts during the 2010 season. He died of natural causes on May 6, 2010, at his home in Temple Terrace, Florida. For the remainder of their 2010 season, the Philadelphia Phillies wore a commemorative #36 patch on their uniforms and hung a Robin Roberts jersey in their dugout during home and away games. Roberts wrote two books about his baseball experiences: The Whiz Kids and the 1950 Pennant (1996, ISBN 1-56639-466-X), and My Life in Baseball (2003, ISBN 1-57243-503-8), both with C. Paul Rogers, III, a law professor at Southern Methodist University. On January 13, 1957, he appeared on the television program "What's My line?" qua his presidency of the Gold King Seafood (shrimp) Company. No-one guessed his occupation or product. 1 2 3 "A Man for All Seasons – MSU Great and Hall-of-Famer Robin Roberts Remembers His Alma Mater and Playing Days". New Educator. Michigan State University College of Education. Fall 2002. ↑ "Spartan Records" (PDF). Michigan State Men's Basketball. 2009–2010. ↑ United Press International, "Yankees Buy Robin Roberts from Phillies," Corvallis [OR] Gazette-Times, Oct. 17, 1961, pg. 8. ↑ "Roberts is 'Retired'". St. Petersburg Times. February 7, 1962. p. 3-C.
↑ John Drebinger (March 22, 1962). "Yanks' Two Homers Help Beat Phils, 13–10; Mets 1–0 Victors Over Tigers". New York Times. ↑ "Robin Roberts Beaten, 1–0, In First Start With Reading". New York Times. April 26, 1967. p. 54. Retrieved 2009-08-11. ↑ "Roberts, Lemon All-Star Captains". St. Petersburg Times. July 6, 1976. p. 3C. ↑ "Watch What's My Line Season 8 Episode 20 S8E20 EPISODE #345". Online Video Guide. Retrieved 9 May 2014. ↑ "MSU Athletics Hall of Fame". Michigan State Official Athletics Site. Retrieved 2009-11-25. 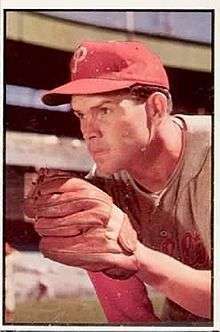 ↑ "Hall of Fame pitcher Roberts dies at 83: Right-hander won 20-plus games six straight years for Phillies". MLB.com. May 6, 2010. ↑ "Robin Roberts, Phillies Great, Dead at 83". MLB FanHouse. May 6, 2010. The editors of the Sporting News (1992). Baseball A Doubleheader Collection of Facts, Feats, & Firsts. St. Louis, Mo. : The Sporting News Publishing Co. ISBN 0-88365-785-6. O'Loughlin, Joe (November 2002). "1950: when Philadelphia's Whiz Kids won the N.L. pennant; memories still rich for those who brought Phillies their first National League title in 35 years – Turn Back The Clock". Baseball Digest. Retrieved 2011-08-24 – via findarticle.com. Pappas, Nicole (August 22, 2011). "Aug. 24, 1954: The Braves knock Phillies ace Robin Roberts out of the game for first time in 14 starts". National Baseball Hall of Fame and Museum. Retrieved 2011-08-24. Wikimedia Commons has media related to Robin Roberts (baseball). History: Tributes: Robin Roberts / 1926–2010. MLB.com.